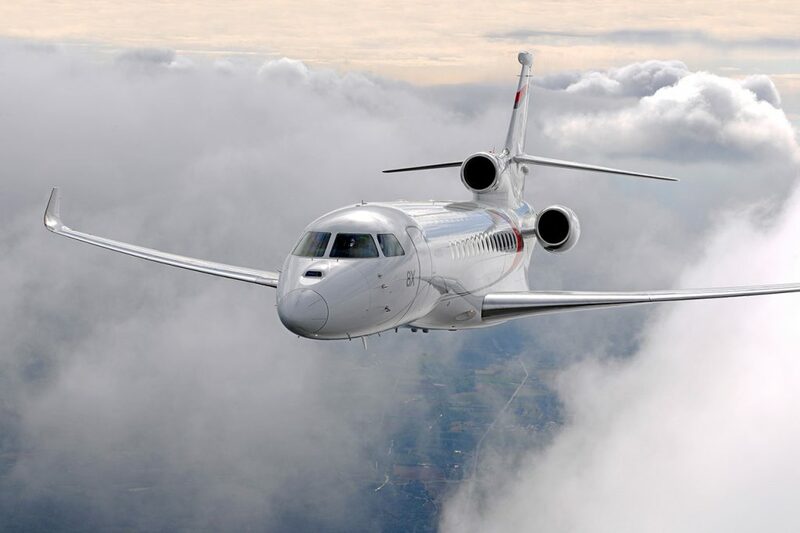 The Dassault Falcon 8x was announced during EBACE 2014 in Geneva, Switzerland as the newest aircraft in the Falcon family of long range jets, allowing executive and luxury travelers to fly farther in greater comfort and with even more efficiency. This large-cabin, long-range, triple-engine business jet from French aerospace manufacturer Dassault Aviation is an improvement upon the already popular 7x, extending the aircraft’s maximum range by 500 nautical miles to 6,450 nm thanks to modified engines, aerodynamic improvements, and increased fuel capacity. The cabin is the longest of all Falcon aircraft, and it’s designed to meet your exact requirements with the most flexible, customizable cabin in the industry, offering more than 30 unique configurations for private jet travelers and corporate flight departments. 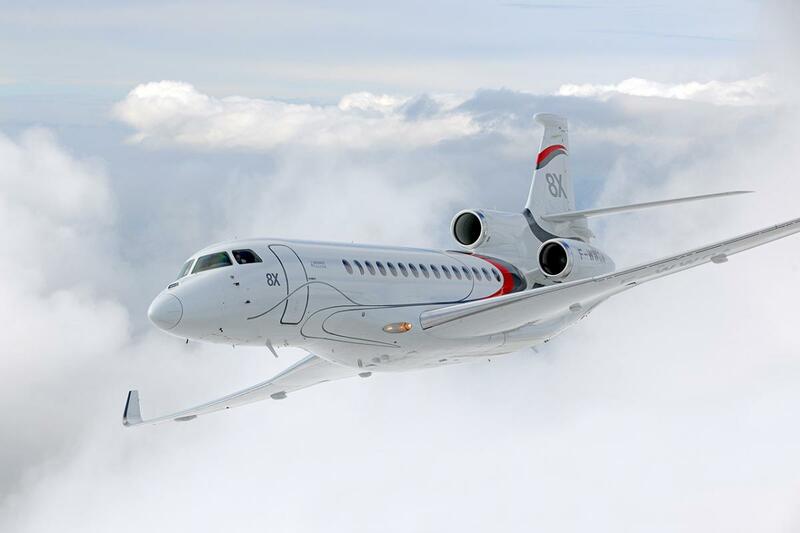 Call ACA at 1-888-987-5387 to learn more about chartering a Dassault Falcon8x. Not only does the 8x offer impressive range and performance for intercontinental flights, it’s triple-engine performance allows for takeoffs utilizing surprisingly short runways; it’s the only ultra-long-range business jet that can depart London City Airport using its diminutive 3,934 foot runway. Whether you’re flying for business or for pleasure, the Falcon8x offers an incredibly comfortable ride, with high air quality and low noise and cabin altitude. Two bathrooms, a galley area and a spacious mid-cabin storage area offer passengers an extremely comfortable flight, seating can also be converted into 5 flat beds for long distance flights, and passengers can bring plenty on board with a 1,695 cubic foot baggage capacity. Many Falcon 8x are equipped with the FalconCabin HD+, a cabin management system that allows passengers to control their entertainment and productivity from anywhere in the cabin using their own devices. The 8x is also a great choice for corporate flight departments and executive travelers, with direct operating costs as much as 35% lower compared to other planes in its class. Improvements to wing design and upgraded Pratt & Whitney Canada PW300 engines result in performance with up to 35% more fuel efficiency than competing jets, and, with its optimized airliner-type MSG-3 maintenance program, inspections are due at 800 hours or 12 months, helping to maximize the operations of your private business aircraft. The average hourly charter rate for a Falcon 8x may vary based on a variety of factors including scheduling, routing, date & time, passengers total, luggage amounts, and more. An available empty legs Falcon 8x private jet may potentially reduce the cost of your flight by up to 50% or more! Whether you’re in the market for on-demand private jet charter, interested in purchasing a Dassault Falcon 8x ultra long-range jet, or require a jet card on a comparable aircraft, our team of Air Charter Advisors are here to assist with all aspects of your private aviation. Call us directly at 1-888-987-5387 or contact us via e-mail with any questions or requests regarding the Falcon 8x. * Average hourly rates are examples and vary depending on make, model and year; amenities, routing and scheduling/availability, and do not include fuel or taxes. All images copyrighted and provided courtesy of Dassault Aviation unless otherwise noted.